Located just 43 miles (68km) outside of Little Rock, Hot Springs is a popular weekend getaway and excursion for both locals and tourists in Arkansas. The small city takes its name from 47 natural hot springs, which supply heated water to a number of spas in town, most notably in the beautiful old buildings on Bathhouse Row, designated a Historic Landmark District. Most of the popular attractions in and around Hot Springs, apart from the spas, involve outdoor activities like mountain biking, hiking, golf, horseback riding and fishing. Parts of the town are actually located within Hot Springs National Park, making it easy to explore the beautiful landscapes of the area. 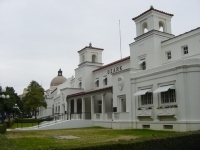 Hot Springs describes itself as 'America's first resort' and the town has been attracting eager travellers for decades.